For anyone who’s struggled to get the answers they need about their worksite out of different file formats, you know just having the data isn’t enough—it needs to be understandable and useable. One of the more popular design file types for worksites is DXF, versatile in the types of data that it can contain and compatible with the widest range of CAD, survey and other industry-specific software packages. 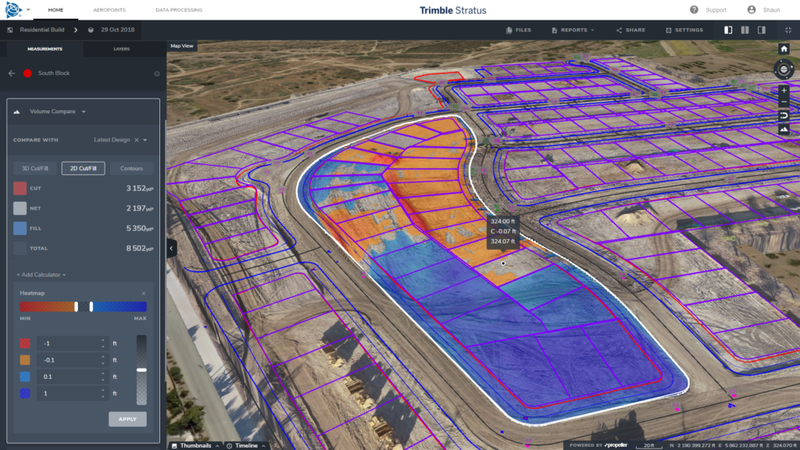 The wide range of capabilities makes DXF incredibly useful, but did you know all the ways you can use them to better measure and manage your worksite? We talked to our very own Kevin Smith about the top five ways DXFs can be used in the Propeller Platform. Thanks to a recent update, you can now drag and drop a DXF file into the Platform. If your DXF file contains a 3DFACE entity type you can measure volumes of features in that DXF file against your 3D survey surface. This workflow cuts the time it takes to make accurate volume measurements by as much as 70% over a traditional CAD workflow, and simplifies the process to three steps. But with drag-and-drop DXFs in Propeller, that boundary is already saved, you can just click your volume calculation type and it’s done in Propeller. Depending on the size of your file, you’re saving on average 10 minutes to an hour, time savings that builds over your workweek. Using a DXF, you can upload one or multiple designs and see what your site looks like today against how it will look when the work is done. This lets you see how you’re progressing overall, as well as what the final site will look at end of life. For example, if you’re on a quarry site, you can view how the quarry looks today as well as have your one-year, five-year, and end-of-life plans overlayed in 3D on that current terrain. With Propeller’s capabilities, the DXFs you upload are just like your CAD package: it’s one file that includes all your layers. You can upload it in one go, and then turn different layers on and off as needed. For example, if you’re on a construction subdivision, you can import your DXF with all the utility lines, property lines, etc. If you need to see where your electrical and plumbing is sitting on the terrain, turning off everything but that utilities layer takes just a few clicks. Seeing what’s on your site in 3D—from real-world features to abstract values—is a powerful visual. Using the information stored in DXF form, you can display info simply and straightforwardly. Below, a DXF surface is shown in 3D. Areas in red are the current drone survey that’s above the design, which means this shows all the cut needed for this site to reach design. Another underestimated ability of DXFs is to see how abstract values look in relation to the site itself. With DXFs, you can add in these values and view them spatially over an up-to-date model of your site. If you’re on a landfill, and you’ve flown a drone to record the air quality, also known as a “gas sniffer,” Propeller can bring those collected points of the air quality which have X, Y, Z values into your 3D survey and overlay it on the terrain. “And, because it’s a DXF, if you’ve got the gas sample figure loaded on there, we can actually see it overlayed on the site,” added Smith. The same goes for soil compaction measurements. Instead of a spreadsheet with coordinates and rates, you can load the DXF with that information into the Platform and see those rates in 3D space. Lastly, a simple but powerful ability is to convert data from DXF files into measurements. If, for example, you have a DXF with a line, you can load it into Propeller and use that same line in 3D to measure your site. This goes for many important benchmarks, like road alignments with cross sections, in DXF files. With one click you can convert the DXF cross-section line into a measurement and compare the surveyed surface to the design file. Basically, “if it’s in a DXF, we can convert it to a measurement in Propeller,” says Smith.